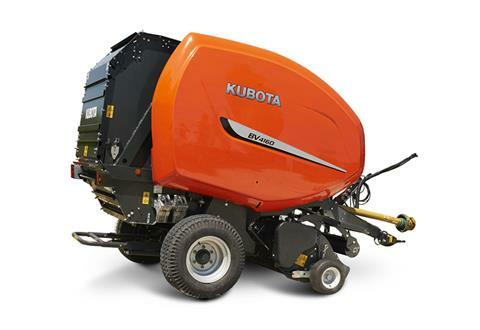 BALING CHAMBER: Kubota's BV4160 Econo bale chamber offers a combination of 3 rollers and 5 wide laced belts. This mixed chamber ensures a smooth bale start whatever the crop type, offering smooth bale rotation and reduced crop loss even in dry conditions. As the bale grows, the belt tensioning arm is subjected to steadily increasing resistance from two hydraulic cylinders and a spring tensioner – as the bale diameter grows, so does the bale's density. The result is a very firm bale. FORK FEEDER: Kubota's BV4160 Econo model is fitted with an efficient fork feeder intake system. This system provides a direct feed into the bale chamber. The wide opening allows almost unrestricted intake capacity for a fast and efficient baling process. In conjunction with a crop deflector, the fork feeder ensures a consistent crop flow into the bale chamber, which ensures high density bales. These models come with a 67 in. pick-up.